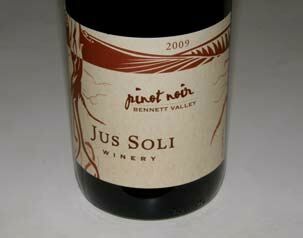 Jus Soli was founded in 2002 when a friend's family had a few extra tons of Pinot Noir from their Mendocino County vineyard and offered it in return for some of the finished wine. The wine was made at Copain by winemaker Tom Garrett. An obscure Latin legal name meaning "Law of the Soil" was chosen (pronounced "Juss Solee"). The three behind the label are Tom Garrett, Jesse Wurtzel, and Mike O'Donnell. Multiple varietals are produced incuding a Pinot Noir from Bennett Valley in 2009. A tasting room is planned for the Kenwood area in 2010. The wines can be acquired through the website. There is extensive restaurant distribution in Northern California and Las Vegas.